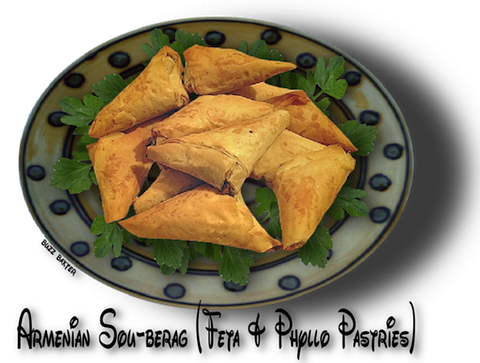 ●  Purchase phyllo dough at your supermarket in (Frozen Pastry). You need 6 sheets plus 3 sheets of phyllo dough the size of the pan you are using (I usually double the sheets as I like the fill doughs crispness. ●  1½ lbs. Jack cheese,  or ricotta,  or Armenian or Greek (Feta) cheese. Mix or take your choice. Feta is the most authentic. I like to mix feta and jack cheese. 1. Butter your cake pan well and lay in a sheet of phyllo,  and butter the top. 2. Put on a layer of filling. 3. Add another phyllo and butter the top and add more filling. 4. Do this until all six sheets of phyllo are used and your filling is used up. 5. You can now add the last three sheets of phyllo making sure to butter each one. 6. Bake in a 450℉ oven for 20 minutes. 7. Lower the heat to 300℉ and bake another 20 minutes. ✸✸The time is not as important as the color of your phyllo dough. Make sure it is a golden brown. 8. Take out the sou-berag and let cool for 5 minutes. 9. Cut in diagonals or squares and serve warm. using the whole strip to make the layers. Like folding a flag. This makes nice little individual packets of cheese turnovers. I like these for parties.